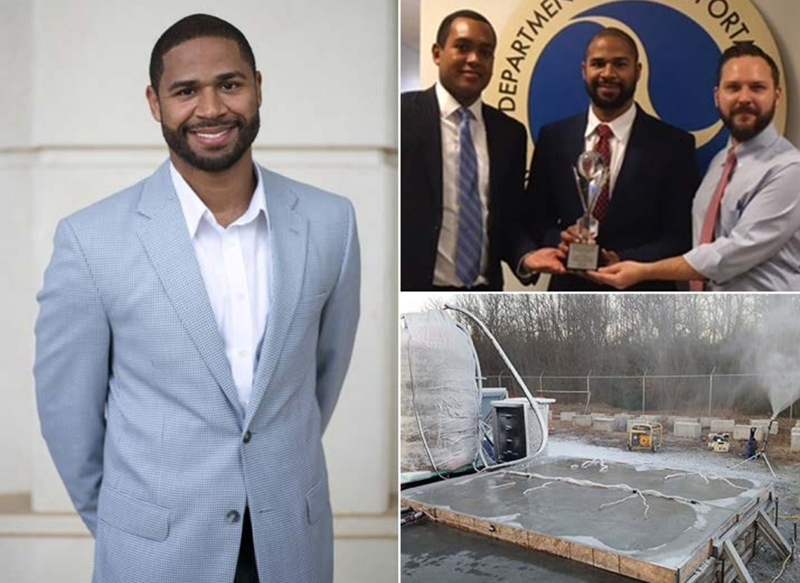 Joseph Daniels, winner of the Recognizing Aviation and Aerospace Innovation in Science and Engineering Award, is developing an anti-icing pavement system for airfields. U.S. Department of Transportation Secretary Elaine Chao has honored University of Arkansas graduate student Joseph Daniels with the Recognizing Aviation and Aerospace Innovation in Science and Engineering award (RAISE). The award recognizes innovative scientific and engineering achievements that will have a significant impact on the future of aerospace or aviation. Daniels, a doctoral candidate in civil engineering, is developing an anti-icing pavement system designed to improve airfield safety during extreme weather. The system aims to use renewable solar energy to lower operational costs of heating surfaces to prevent flight delays, cancellations and potential accidents. The idea is to incorporate wiring into concrete, then use solar energy to power the transfer of heat through the wires to warm the pavement. "My system runs like a thermostat," Daniels said. "When the concrete drops below a certain temperature, it turns on, and that's with or without snow." Dan Elwell, acting administrator of the Federal Aviation Administration, commended Daniels for his innovative solution that addresses multiple components of the FAA's mission. "Mr. Daniels reflects a passion for aviation improvements overall and shows a willingness to continue to explore additional solutions to a problem," Elwell said. Daniels, who applied for the honor at the urging of Heymsfield, was stunned when he learned he won the RAISE award. "I had prayed about it and kept it in my prayer journal for a long time," he said. "Being able to have this was outstanding. It definitely brought a smile to my face and an amazement about what God can do." A native of Silver Spring, Maryland, Daniels earned a bachelor's degree in civil engineering at North Carolina A&T State University. He is on track to compete his doctorate at the University of Arkansas in summer 2018.